Happy Blue Badger 10 AQHA 2010 gray stallion - Happy Blue Badger is Line Bred to Legends ~ Peter McCue 37 times, Midnight 13 times, Yellow Wolf 13 times, John Wilkins 10 times, Joe Hancock 7 times, Yellow Jacket 7 times. 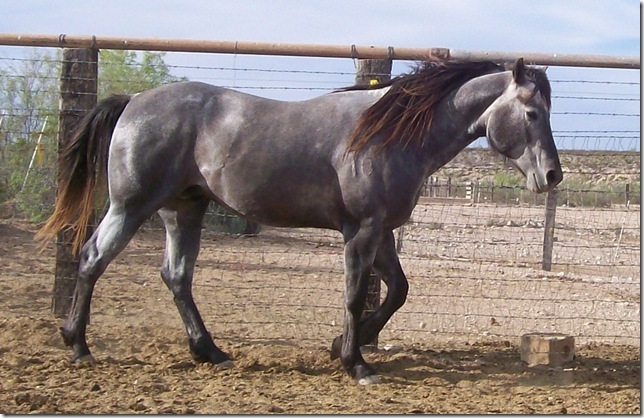 Happy Blue Badger 10 is line bred Hollywood Gold and Blue Rock, one of the Foundation Quarter Horses Greatest Genetic Cornerstones including Best Remuda Award Winers 6666 & RA Brown Ranches and in the Reining & Cow Horse Industries. 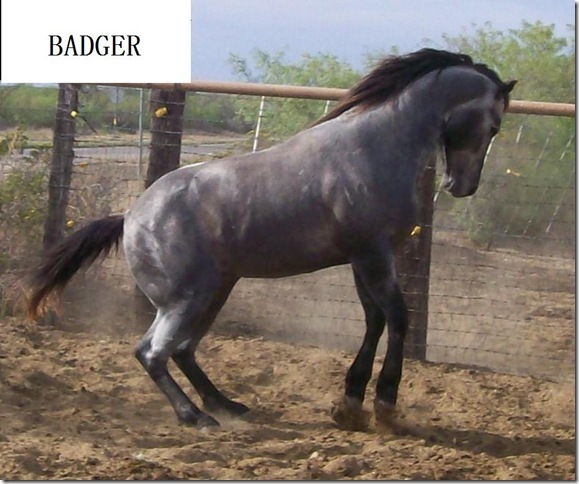 Happy Blue Badger 10 is line bred (37.50%) Flying X 6, whose accomplishments include - NCHA Certificate of Ability, Honor Roll Working Cow Horse, ROM with points in 4 Events, Honor Roll and High Point producer. High Point Working Cow Horse /3rd Place (1986-Open); Performance Register of Merit (1981-Open). Earned: 27 Performance Wins; 41.0 Performance Points; 1 Performance Register of Merit. Other Earnings: National Cutting Horse Association $549.71. Flying X 6 Sired: 363 Foals, 41 Performers. with the following Summary: 71 Performance Wins; 269.5 Performance Points; 5 Novice Wins; 4.5 Novice Points; 9 Performance Register of Merits; 1 Performance Superior Award; 1 Reserve World Championship; 1 All Around Championship. Other Earnings: AQHA Incentive Fund $2,045.28; AQHA World Championship Show $1,462.16; National Cutting Horse Association $9,739.24; National Reined Cow Horse Association $821.75; International Buckskin Perf Points. 3.0. Flying X 6 is the Maternal Grandsire of: 422 Foals, 17 were Performers with the following Performance Summary: 36 Performance Wins; 123.5 Performance Points; 5 Performance Register of Merits; 1 World Championship; 1 Reserve World Championship. 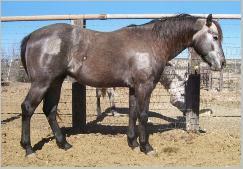 Other Earnings: National Cutting Horse Association $147.00. Happy Blue Badger 10 is Line Bred 18.75% Salty Blue who produced ROM Performance Offspring; NCHA Money-earners; Performance Point Earners. AQHA Offspring Record Total Points Earned: 87; Reg Foals: 151; Number Shown: 13; Point Earners: 12; Performance Points Earned: 87; Performance Point Earners: 14; Performance ROMS: 1. Happy Blue Badger 10 is Line Bred 9.375% Happy Hancock who produced NCHA Money-earners and Performance Point Earners. Happy Blue Badger is Line Bred to Legends ~ Peter McCue 37 times, Midnight 13 times, Yellow Wolf 13 times, John Wilkins 10 times, Joe Hancock 7 times, Yellow Jacket 7 times. 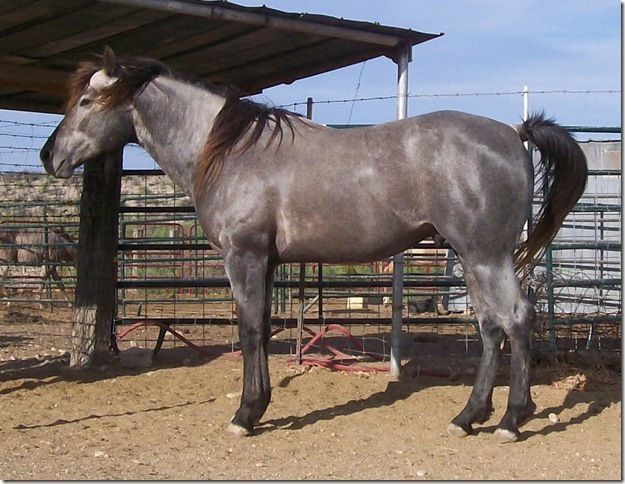 Happy Blue Badger 10 is line bred Hollywood Gold and Blue Rock, one of the Foundation Quarter Horses Greatest Genetic Cornerstones including Best Remuda Award Winers 6666 & RA Brown Ranches and in the Reining & Cow Horse Industries.